Wow! Powerful...and so sad. Thanks so much for sharing this with us. An unusual insight into life in the 1860's. Thank you for sharing this sad, but poignant post about your ancestors' lives during a very difficult time. You are so very fortunate to have this diary that provides such insight into life in Texas during the mid-1800s. Thank you for sharing. It is easy to forget what fortunate times we live in with much advances in medical treatments in the last generation. You have so many lovely things going on in your blog space. 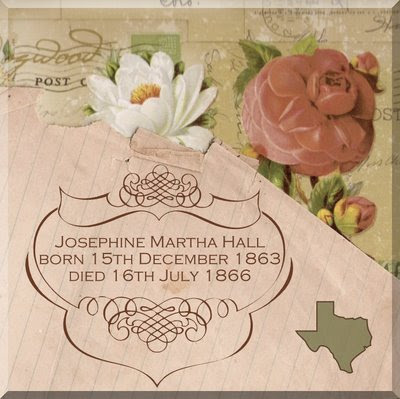 Thank y'all so much for dropping by to get to know our little Josephine -- I'm glad you enjoyed her brief life story! My introduction to this journal of her father's began with me planning a family reunion in 1998 . . . and then actually going to visit a distant (previously unknown) cousin. You gotta follow through with those leads -- you never know where they will take you! Great post, thank you for sharing. You are very fortunate to have your ancestor's diary and to have this glimpse into their day to day lives. I particularly enjoyed how he called his wife the "little woman."